Ataxia Telangiectasia, or A-T, is a neurodegenerative disease that affects people of all racial and ethnic groups. Symptoms usually begin in early childhood, though they appear later or much later in a minority of cases. The most common first problem is a wobbly walk --- the person walks in an unsteady, unbalanced, drunken-looking way. This type of gait is normal in children who are just learning to walk, but it may not go away in those with A-T. The problem may be present from a child's first steps, or it may appear later. In some, it may appear to get better as the child gets slightly older, only to worsen again later. Young children with A-T may also sway or have balance problems while walking, standing, or sitting. A gait abnormality was the first sign of disease in 88% of published cases that we examined (115 out of 130 patients for whom information was available). People with A-T have a variety of other problems, as well, including immunodeficiency, delayed puberty, susceptibility to cancer, and early aging. A-T is a progressive disorder, which means that it gets worse as time passes. A-T has been classified as a member of different groups of diseases. One of them is the DNA repair disorders. All the disorders in this group cause problems in fixing damaged DNA. Damage to DNA happens constantly. It is caused by such things as ultraviolet light in sunlight and flourescent lights. Other things that can damage DNA include ionizing radiation from X-rays and other medical devices. Chemicals, normal processes in cells, and other substances or processes can also damage DNA. Because damage occurs all the time, living things have evolved many systems for fixing it. There are proteins that recognize that damage has occured, enzymes that remove the damaged DNA, and enzymes that insert new, undamaged DNA bases. This list is not exhaustive. When a person has a defect in one of these repair systems, disease results. If the problem is in a system that fixes damage from UV light, a person may be extremely photosensitive, with some people burning badly after only a brief exposure on a cloudy day. Overall, DNA most people with DNA repair disorders have a high risk of cancer. A-T occurs equally among males and females, and is found in all racial and ethnic groups. It is a very rare condition. For example, a rigorous study published in 1986 found that the incidence of A-T in the US was 11.3 cases per million live births during two periods studied (roughly 1 birth per 88,000; 1). Its prevalence in eastern France was estimated at 1 person per 400,000 in 2010 (2). Other estimates make it roughly twice as common as the first estimate or almost as rare as the second. Whatever the true figures, clinicians and researchers in the field generally agree that A-T suffers from under-diagnosis. In particular, mild cases may not be diagnosed (3). Children with A-T often appear to be normal during the first year or so of their lives. Most begin walking on time, but as noted, many have abnormal gaits that may be constistently wobbly and unsteady. Some children have this problem from the time they take their first steps, while others don't develop it until age 2 or 3. Regardless, this "wobbly walk" is often the first sign of diease. A minority of patients with a milder form of A-T don't develop gait problems until much later (see Mild A-T, below). These gait problems are of a form called ataxia, which means that a person has trouble coordinating muscle movements due to problems in the central nervous system. 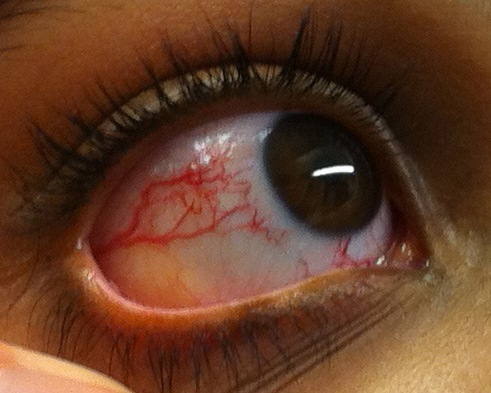 Another hallmark of A-T is the appearance of dilated blood vessels in the eyes (see photos). 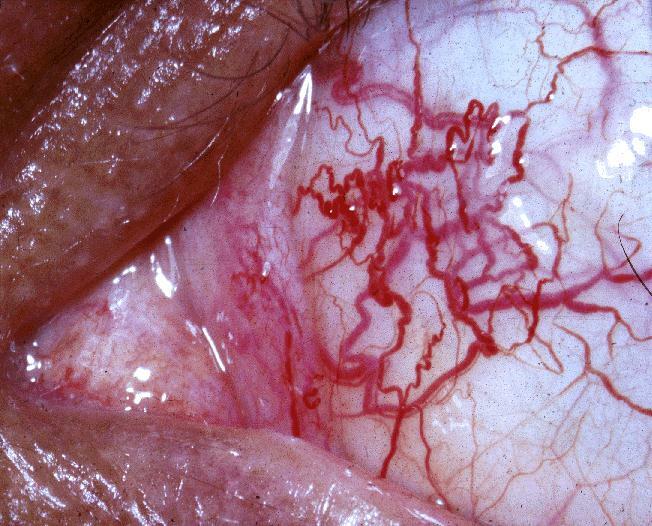 These blood vessels are called telangiectasias. In many cases, they also appear on the skin. In patients with classic A-T, they tend to appear between the ages of 5 and 8. Although they don't occur in every A-T patient, they are very common. For example, in our survey of the literature, they were seen in 92% of 500 classic A-T patients for whom information was available, and in 53% of patients with mildo A-T (information available for 64 patients). Additionally, A-T patients often develop a peculiarity of eye movement called apraxia. When applied to the eyes, this term means that patients have trouble moving their eyes horizontally in order to watch a moving object. They have trouble with commencing eye motion, and may have to turn their heads in order to watch the object move. This problem was described in a large majority of A-T patients in our literature survey (86% of ~350 classic A-T patients, and 68% of 74 mild A-T patients for whom information was available). Common signs and symptoms of A-T are listed below. *Some people with neurological disorders have balance problems that get worse when they close their eyes. This characteristic is called Romberg's sign after the doctor who first described it. It is common in people with ataxia with vitamin E deficiency and Friedreich ataxia. A Romberg's sign is less likely to be seen in people with A-T because their balance tends to be poor even when their eyes are open. The classic form of A-T is the more severe form of the disease. Patients progressively lose the ability to walk and do other tasks, with most needing wheelchairs around the age of 10 years. They typically become completely dependent on wheelchairs as time passes. In addition, the gaze apraxia noted above may make it difficult for patients to read, and loss of control of facial muscles interferes with talking and facial expressions. Involuntary movements also occur. Problems with the immune system leave many A-T patients vulnerable to infections, including pneumonia and other respiratory infections. Lung disease is a common cause of death in A-T, and patients should therefore be monitored closely for signs of lower respiratory infection. Like other people with DNA repair disorders, A-T patients are at increased risk for developing cancer, with leukemia and lymphoma being the two most common malignancies that are found (4). Breast cancer may also occur. Overall, A-T is a fatal disease, with death occuring at a relatively young age. In contrast to decades past, most patients survive past age 25 (5). This increase is due to advances in medical care, but pulmonary problems remain a major cause of death. Some people have a form of A-T that differs from the classic form. In many, symptom onset is later, the disease is less severe, and life expectancy is longer than in classic A-T. For example, some patients with the milder form of A-T may not show signs of disease until they are school-aged (6-8), teenaged (9, 10) or even adults (11, 12). Their neurological signs may be minimal, causing them to remain undiagnosed until a health event such as abnormal response to cancer treatment unmasks the condition (13). As a result, it is possible that many people with very mild forms of A-T do not receive a correct diagnosis at all. Alternatively, in others with mild A-T, symptom onset is at an early age, but disease progression is slower (3, 14). 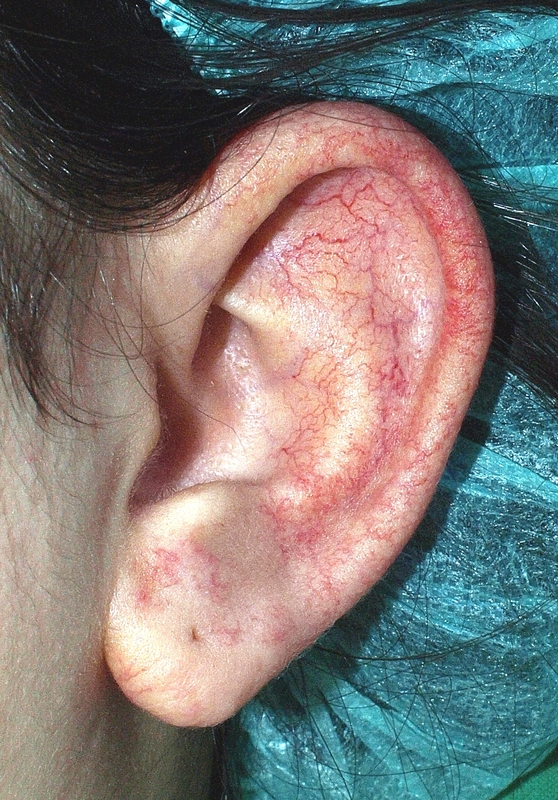 Diagnosis may be difficult in these patients because clinical signs are not specific. For example, they may be limited to an awkward gait and clumsiness, characteristics that apply to many unaffected people. Diagnosis is further complicated by the fact that there is greater variability among the clinical features of the mild forms of A-T, including a reduced prevalence of telangiectases. In addition, the classic form of A-T is better known than the mild forms, meaning that clinicians may dismiss A-T in a mildly affected patient. Thus, while most known cases of A-T are of the more severe classic form, there is still wide variation in its clinical features. A recent carefully-considered paper proposed renaming all forms of A-T (classic A-T, mild A-T) to ATM syndrome (15). This new designation would tie together a group of currently disparate conditions, would simplify classification, and reduce the overall number of rare diseases. However, the new classification could complicate diagnosis, given the significant differences between classic A-T and mild A-T. Thus, maintaining separate diagnostic categories under the umbrella of ATM syndrome could be beneficial. A-T is an autosomal recessive disorder caused by mutations in the gene ATM. The term autosomal recessive means that the disorder is passed on when both	parents contribute a copy of the mutated gene to their child. The ATM gene makes a protein that is also called ATM, which has an important role in repairing double strand breaks in DNA. DNA is a long molecule made of two separate strands that twist together. Ionizing radiation such as X-rays and cosmic rays break both strands of DNA. These breaks are an important cause of cancer in people who have suffered radiation injury. Unlike other people, people with A-T cannot repair these breaks. Because background levels of ionizing radiation are very low, they are not the primary source of radiation concern for A-T patients. Rather, larger problems come from two sources: normal body processes (see below) and the use of radiation therapy to treat cancer. A-T patients are at high risk for for this condition, with 38% developing a malignancy (usually leukemia or lymphoma; 5). While radiotherapy is beneficial overall for many people, it can do more harm than good in A-T patients, and should be avoided if possible. Similarly, anti-cancer drugs that mimic radiation therapy should also be avoided if possible. Radiation therapy in the usual doses can be very dangerous for these patients, even those with very mild cases of A-T (13). In addition, the use of imaging equipment that uses ionizing radiation (X-rays, CT scanners, etc.) should be used carefully in this patient population (see reference 5 for details). relatively limited amount of DNA to produce millions of antibodies that can recognize pathogens. This process is called VDJ recombination. When it isn't working properly, a person becomes susceptible to infections. Because A-T patients have problems with repairing double strand breaks (16), they also have trouble creating antibodies. They also have fewer lymphocytes than normal. The result is immunodeficiency and susceptibility to infection. The milder forms of A-T occur in patients with some ATM activity, while the classic form occurs in those with no ATM activity (17). Patients with mild A-T and some ATM activity are also better able to fight infection. For example, in our literature survey, 79% of classic A-T patients had immunodeficiency compared to only 29% of those with mild A-T.
A-T is usually suspected in a patient whose clinical features include certain neurological problems (ataxia, difficulties with eye movement, and difficulty with balance), in addition to telangiectasias of the eye, and possibly frequent infections. In addition, people with A-T typically have very high levels of AFP (alphafetoprotein) in their serum. Finally, finding a mutation in the ATM gene provides a definitive diagnosis. Laboratory testing for serum alphafetoprotein (AFP) can help diagnose A-T. AFP levels are high or very high in the vast majority of people with A-T. However, because they are normal in a small minority of cases (4-5% in our literature survey), a negative test is not definitively negative for A-T. A definitive diagnosis can be made via molecular methods such as sequencing of the ATM gene. The links on the right side of this page provide information about testing labs around the world. People who carry one copy of a mutated ATM gene are called carriers. Because A-T occurs when both parents pass a mutated copy of ATM, all parents of affected patients are carriers. Carriers do not have the neurological problems that A-T patients have, but they do have a higher risk for cancer (5, 18). information. Because A-T is so rare, it is frequently mistaken for other conditions. A number of them are listed below. Cerebral palsy (CP) is a common misdiagnosis among not only A-T patients, but many others with progressive neurological disorders. This particular mistaken diagnosis tends to occur because of a combination of factors. First, very young patients with A-T may not have developed all of the signs of disease, and the awkward gait and potential speech problems in a very young child may resemble CP. Additionally,CP is relatively common, whereas progressive disorders like A-T are very rare. Thus, clinicians may know very little, if anything about A-T. The most important clinical feature distinguishing CP from A-T is that problems in CP don't get worse, whereas they do in A-T.
Hyper IgM syndrome (HIGM). HIGM causes immunodeficiency. Patients tend to develop serious infections by the age of two, with a large majority devoloping them before their first birthdays. Pneumonia is common, as is sinusitis, ear infections, diarrhea, and skin infections. Cardinal findings in HIGM are low serum levels of antibodies of the types IgG and/or IgA combined with normal or high levels of IgM. This set of findings also occurs in many people with A-T. One feature that can distinguish the two conditions is that most patients with HIGM do not develop neurological problems, while neurological problems are typically the first problem noticed in A-T. Importantly, however, some people with HIGM develop neurological abnormalities, generally as a consequence of CNS infection. Blood tests can distinguish the two conditions, as different genes are mutated in each disease. In addition, A-T patients have high levels of a AFP (normal in HIGM), while HIGM patients may have no CD40 ligand or CD40 on their white cells. Friedreich ataxia (FRDA) FRDA is a progressive neurological disorder. Its clinical features are similar to those of A-T, and include gait ataxia and other forms of ataxia, such as dysarthria/speech disorder, and problems with upper limb movements. However, there are differences between the two conditions that can help distinguish them. First, in contrast to classic A-T, the signs of FRDA generally appear between the ages of 8 and 16 years (19, 20). Additionally, several clinical features are common in FRDA but do not generally occur in A-T. Most importantly, FRDA patients do not generally have the eye telangiectasias and gaze abnormalities that are characteristic of A-T. These patients do, however, have scoliosis and a positive Romberg's sign. A Romberg's sign occurs when a person has balance problems that get worse when he closes his eyes. It is important to understand that A-T patients tend to have difficulty maintaining balance with eyes both open and closed. A-T patients do not generally have scoliosis. Ataxia with oculomotor apraxia type 1 (AOA1). Like A-T, AOA1 is a progressive neurological disorder involving ataxia. Also like A-T, most people with AOA1 begin to experience ataxia in early childhood, at an average age of 4.3 years (21). Onset is between ages 2 and 10 in most patients. Another similarity to A-T is that people with AOA1 develop oculomotor apraxia (see above for a description of this problem). In both groups, MRI of the cerebellum is likely to show atrophy. Patients with both conditions also lose their tendon reflexes (e.g. knee jerks). In spite of these similarities, there are also significant differences between the two conditions. They are summarized in the table below." In spite of these similarities, there are also significant differences between the two conditions. They are summarized in the table below. The following are shared between AOA1 and A-T: ataxia that tends to begin in early childhood, oculomotor apraxia, atrophy of the cerebellum, lost/diminished tendon reflexes such as knee jerks, and choreiform movements (jerky movements of the limbs). Finding mutations in the gene APTX can also provide a definitive diagnosis of AOA1, while mutations in ATM diagnose A-T.
Ataxia with oculomotor apraxia type 2 (AOA2). AOA2 is a progressive neurological disorder involving ataxia. 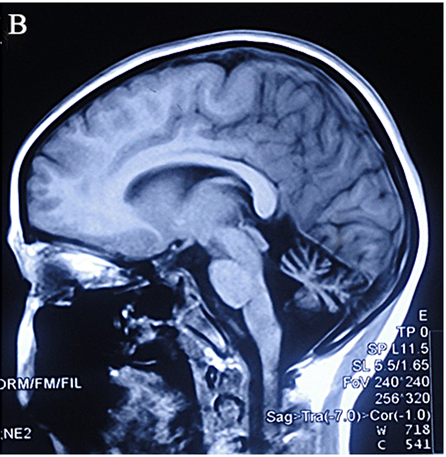 A difference between from classical A-T is that ataxia in AOA2 tends to develop later (average age: ~14 1/2 years; 22), although it can appear as early as age 3, it may also not do so until age 30. In this respect, AOA2 may resemble mild A-T more than classic A-T. Oculomotor apraxia occurs in AOA2, in roughly half of patients, as compared to a large majority of patients with A-T. Like A-T, serum AFP levels are raised in AOA2 patients, and atrophy of the cerebellum and lost or diminished tendon reflexes are very common findings in both conditions. There are also significant differences between the two conditions, as summarized in the table below. AOA2 is caused by mutations in the gene SETX. Mutations in this gene are also associated with type 4 of juvenile amyotrophic lateral sclerosis (ALS4; 23). This condition is not as severe as other forms of ALS, and while it may be debilitating, it does not appear to affect life expectancy. The following are shared between AOA2 and A-T: ataxia (may not begin in early childhood in AOA2), oculomotor apraxia, elevated levels of serum AFP, atrophy of the cerebellum, lost/diminished tendon reflexes such as knee jerks, choreiform movements (jerky movements of the limbs). 1. Swift M et al. (1986) The incidence and gene frequency of ataxia-telangiectasia in the United States. Am J Hum Genet 39(5):573-583. Full text on PubMed. 2. Anheim M et al. (2010) Epidemiological, clinical, paraclinical and molecular study of a cohort of 102 patients affected with autosomal recessive progressive cerebellar ataxia from Alsace, Eastern France: implications for clinical management. Neurogenetics 11(1):1-12. Abstract on PubMed. 3. Claes K et al. (2013) Variant ataxia telangiectasia: clinical and molecular findings and evaluation of radiosensitive phenotypes in a patient and relatives. Neuromolecular Med 15(3):447-457. Abstract on PubMed. 4. Reiman A et al. (2011) Lymphoid tumours and breast cancer in ataxia telangiectasia; substantial protective effect of residual ATM kinase activity against childhood tumours. Br J Cancer 105(4):586-591. Full text on PubMed. 5. Gatti R & Susan Perlman (1999) Ataxia-Telangiectasia. Updated October 27, 2016 GeneReviews [Internet] Pagon RA et al., editors. Seattle (WA): University of Washington, Seattle; 1993-2019. Full text. 6. Alterman N (2007) Ataxia-telangiectasia: mild neurological presentation despite null ATM mutation and severe cellular phenotype. Am J Med Genet A 15(143A):1827-1834. Abstract on PubMed. 7. Dörk T et al. (2004) Slow progression of ataxia-telangiectasia with double missense and in frame splice mutations. Am J Med Genet A 24(11):272-277. Abstract on PubMed. 8. Verhagen MM et al. (2012) Neuropathology in classical and variant ataxia-telangiectasia. Neuropathology 32(3):234-244. Abstract on PubMed. 9. Taylor AM et al. (1987) Variant forms of ataxia telangiectasia. J Med Genet 24(11):669-677. Full text on PubMed. 10. Stell R et al. (1989) Ataxia telangiectasia: a reappraisal of the ocular motor features and their value in the diagnosis of atypical cases. Mov Disord 34(4):320-329. Abstract on PubMed. 11. Hiel JA	et al. (2006) Distal spinal muscular atrophy as a major feature in adult-onset ataxia telangiectasia. Neurology 67(2):346-349. Abstract on PubMed. 12. Saviozzi S et al. (2002) A late onset variant of ataxia-telangiectasia with a compound heterozygous genotype, A8030G/7481insA. J Med Genet 39(1):57-61. Full text on PubMed. 13. Byrd PJ et al. (2012) Severe reaction to radiotherapy for breast cancer as the presenting feature of ataxia telangiectasia. Br J Cancer 106(2):262-268. Full text on PubMed. 14. Gilad S et al. (1998) Genotype-phenotype relationships in ataxia-telangiectasia and variants. Am J Hum Genet A 62(3):551-561. Full text on PubMed. 15. Teive HA et al. (2015) Ataxia-telangiectasia - a historical review and a proposal for a new designation: ATM syndrome. J Neurol Sci 355(1-2):3-6. Abstract on PubMed. 16. Bredemeyer AL	et al. (2008) Aberrant V(D)J recombination in ataxia telangiectasia mutated-deficient lymphocytes is dependent on nonhomologous DNA end joining. J Immunol 181(4):2620-2625. Full text on PubMed. 17. Verhagen MM (2012) Presence of ATM protein and residual kinase activity correlates with the phenotype in ataxia-telangiectasia: a genotype-phenotype study. Hum Mutat 33(3):561-571. Abstract on PubMed. 18. Swift M et al. (1987) Breast and other cancers in families with ataxia-telangiectasia. N Engl J Med 316(21):1289-1294. Abstract on PubMed. 19. Harding AE (1981) Friedreich's ataxia: a clinical and genetic study of 90 families with an analysis of early diagnostic criteria and intrafamilial clustering of clinical features. Brain 104:589-620. Abstract on PubMed. 20. Filla A et al. (1990) Genetic data and natural history of Friedreich's disease: a study of 80 Italian patients. J Neurol 237(6):345-351. Abstract on PubMed. 21. Coutinho P & Barbot C (2002) Ataxia with oculomotor apraxia type 1. Updated March 19, 2015. GeneReviews [Internet] Pagon RA et al., editors. Seattle (WA): University of Washington, Seattle; 1993-2019. Full text. 22. Moreira MC &ammp; Koenig M (2004) Ataxia with oculomotor apraxia type 2. Updated July 12, 2018. GeneReviews [Internet] Pagon RA et al., editors. Seattle (WA): University of Washington, Seattle; 1993-2019. Full text. 23. Chen Y-Z et al. (2004) DNA/RNA helicase gene mutations in a form of juvenile amyotrophic lateral sclerosis (ALS4). Am J Hum Genet 74(6):1128-1135. Full text on PubMed. 24. Crawford TO (2011) Photo: Ocular telangiectasia in a person with A-T. File on Wikimedia Commons. 25. National Eye Institute (2008) Photo: Close view of ocular telangiectasia in a person with A-T File on Wikimedia Commons. 26. Kersseboom R et al. (2011) Educational paper: syndromic forms of primary immunodeficiency. Eur J Pediatr 170(3):295-308. Full text on PubMed. 27. Chen Z et al. (2015) Targeted next-generation sequencing revealed novel mutations in Chinese ataxia telangiectasia patients: a precision medicine perspective. PLoS One 10(10):e0139738. Full text on PubMed. 28. Peter KD (2011) Photo: Angeborene Teleangiektasie der linken Ohrmuschelhaut bei 13 Jahre alter Frau türkischer Abstammung (telangiectasias on the left ear of a 13-year-old girl of Turkish ancestry). File on Wikimedia Commons. 29. Shaikh AG et al. (2013) Disorders of upper limb movements in ataxia-telangiectasia. patients: a precision medicine perspective. PLoS One 8(6):e67042. Full text on PubMed. Your browser does not support the MP4 format. Above: A boy with A-T. See reference 29. Above: Close view of telangiectasias in A-T. Reference 25. 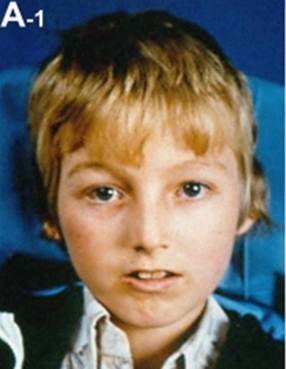 Below: A boy with A-T; the disease causes his face to lose expression. See reference 26.
space around it). See reference 27 for more information.